Dr. Brownstein says, “Years ago salt manufacturers decided that pure white salt is prettier than off-white salt and that consumers prefer pretty white salt. So they started bleaching it. They also added anti-clumping agents to increase its shelf life. The problem is that the chemicals added to keep salt from absorbing moisture on the shelf interfere with one of salt’s main functions: to regulate hydration in your body. The sodium chloride in table salt is highly concentrated, denatured, and toxic to your body. Ever put salt on an open cut? It burns!!! Refined salt has the same effect on internal tissues and causes a negative reaction: your body retains water to protect itself, and your cells release water to help dilute, neutralize, and break down the salt. This loss of water dehydrates and weakens your cells and can even cause them to die prematurely. Natural sea salt is far superior to chemically-treated iodized table salts as it contains all 92 trace minerals, and it’s only 84% sodium chloride while table salt is almost 98%”. All this adds up to one thing. Table salt, whether marine or not, is toxic—it’s poisonous to the body and is responsible, in great part, to the onset of many terrible diseases including thyroid and metabolic dysfunction. 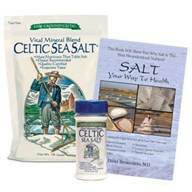 Celtic Sea Salt 22-pound bag is $88.00. The ideal way to use Himalayan Crystal Salt is in the form of a sole (so-LAY). Drinking the sole when you awake each morning is like getting up on the right side of the bed. It provides the energizing minerals you need daily to recharge your body, and it helps set the stage for a day of vitality. Essentially, a sole is water saturated with Himalayan Crystal Salt. The sole contains about approximately 26 parts of salt to 100 parts of water. Prepare the water and salt combination in advance (see directions to the right). Each morning place a teaspoon of the sole mixture in a glass and fill with 8 ounces of pure spring water. Drink it immediately or sip it while getting dressed, checking emails or preparing breakfast. The water helps transport the electrolytes throughout the body to all the many places they are needed. Sole is a mixture of water and salt. The object is to saturate the water with dissolved salt so it can’t hold anymore. You’ll know that you’ve created sole when there are undissolved salt crystals in the water. You can’t oversaturate the water with salt. The crystals will simply drop to the bottom of the container. Cover the salt with two to three inches of pure, spring water. Let the salt dissolve for 24 hours. If all the salt dissolves in 24 hours, add more salt to the container. The sole is finished when the water can no longer dissolve the salt and the salt crystals drop to the bottom of the container. There will always be salt crystals in the jar. It doesn’t matter if you have only a few crystals or many. The water is saturated and is now sole. The vibrational energy of the Himalayan Crystal Salt remains in your body for 24 hours. A teaspoon of sole contains 480 mg of sodium, or 20% of the Daily Reference Value of 2400 mg based on a 2,000 calorie per day diet. 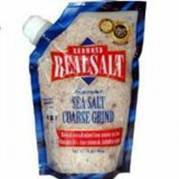 Redmond Real Salt is mined in the United States and is another good unrefined salt that I also recommend. 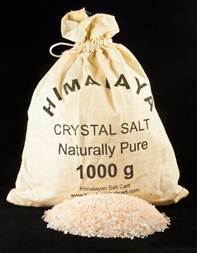 It can be used as a table salt and for cooking and is available in coarse and fine grinds and in a variety of sizes. 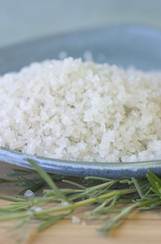 Real Salt comes from a mineral rich salt deposit formed by an ancient sea in Utah. It contains 62 trace minerals, and is without additives, chemicals, or heat processing of any kind. 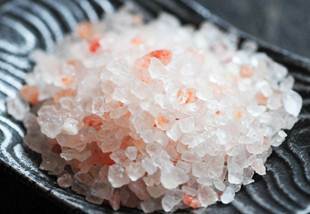 Real Salt’s unique pinkish appearance and flecks of color come from the more than 60 naturally occurring trace minerals. The result is a delicate “sweet salt” flavor that you may not have experienced before. Special Note: I was very disappointed to hear Dr. Max Gerson’s daughter Charlotte Gerson saying, “That sodium is never good, never in any form!” I have put Gerson in the best light in my writings and his organization does hold the high ground for organic raw juicing but there are some things they say that have no grounding in medical science or clinical reality. 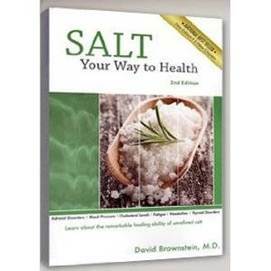 Talk to Dr. David Brownstein and he will tell you that often the first thing a patient needs is water and salt but its real salt not table salt he is talking about and prescribing for his patients. I have written a full essay addressing this communication from Charlotte. And I have another essay on using seawater as a medicine and that will be seen in my Treatment Essentials book that is now finished and ready for publication on the 15th of February. To even think of discounting the medical miracles from the sea, which Charlotte is clearly doing, makes me shudder. Tagged blood pressure, celtic salt, himalayan salt, salt, sea salt. Bookmark the permalink.